The prognosis for our planet, now widely accepted, is shattering our vision of a bright future for our cities, characterised by abundance and technological expansion. As a result, we urgently need to envision and confront the scenarios that are likely to become our reality, in the hope that this work of imagination can help us to adapt effectively and perhaps steer a different course. This post is part of our series of articles on the Urban Commons sourced from the Green European Journal Editorial Board. These were published as part of Volume 16 “Talk of the Town: Exploring the City in Europe”. In this instalment, Pablo Servigne, an agronomist and expert in ecology, behaviour and evolution of social insects, examines the role of the city on the midst of a convergence of ecological and social crises. Cities around the world today face a whole host of grave threats: from pollution to climate change, resource scarcity to overpopulation, and many more. Growing awareness of this has led to a proliferation of ‘solutions’ such as ‘green’, ‘sustainable’, ‘smart’, ‘resilient’, ‘zero-carbon’ projects, as well as ‘eco-neighbourhoods’. But how effective can these initiatives hope to be, in light of the scale of the problems faced? Our vision of the future is in dire need of being injected with a good dose of realism. The vision of a ‘linear’ urban future is in effect fed by the imagery of abundance forged during post-war reconstruction. Yet the conditions of such prosperity are no longer in place. A closer look at the principal threats facing cities can serve as a base from which to devise potential future scenarios. By stimulating our imagination, it is hoped that this conceptual framework will help us design urban policies which are more credible and less unsustainable than those we have witnessed so far. Resource shortages (metals, water, wood, energy, etc) also fall within these major threats. In fact, there is nothing simpler than seriously disrupting a city: it’s merely a matter of blocking its food and energy supplies. These are amongst the worst threats a city can face, because the social, economic and then political effects are felt almost immediately (within a matter of days). Hence the prioritisation of food security by all governments over the centuries. Serious threats are also posed by certain types of pollution. As well as the heavy metals and organic compounds polluting the soil, and aerosols already rendering certain towns unliveable, there is the risk of major industrial accidents forcing entire urban populations to be evacuated. Cities must learn to anticipate all this, to absorb the shocks, to recover, and to learn from these events, most of which are already happening in certain parts of the world. Simply to achieve this, they need resources, energy and a degree of social order, which are increasingly hard to guarantee. In fact, all these threats can be considered to come from outside the city (external threats). But there is another equally serious, and less well known, type of threat: internal threats. These arise mainly from vulnerable infrastructure and social conflict. It is well-known to historians and archaeologists that a town’s capacity to grow and thrive depends on its capacity to safeguard good communication, transport, and distribution networks. Today, much of the transport, electricity, and water infrastructure in OECD countries is over 50 years old (over 100 years old, in some cases), and is already operating well beyond maximum capacity. The extent of its interconnection, complexity, and homogeneity, and the speed of movement of the components of city life, have also increased the vulnerability of this infrastructure. It is thus also easily destabilised by one-off events such as floods, hurricanes, and terrorist attacks. In the cities of industrialised countries – including, need we add, Europe – it is highly likely that we will reach ‘peak urbanisation’ over the next decade. Last, but not least, all these threats are interdependent, and nowadays operate at a globalised level. Large, homogeneous, fast-moving, deeply interconnected international networks have – paradoxically – become more resistant to small disturbances, but more vulnerable to major disruptions, which, when they occur, can trigger a domino effect throughout the system, leading to collapse. Scientists speak of a new kind of risk: the ‘systemic global risk’ inherent in these extensive complex networks, and, as major nodes in these global networks, cities are very exposed to these risks. With that in mind, four scenarios can be envisaged. The aim is not to alarm, nor to predict the future, but to stimulate the imagination and test the effects of these threats against possible futures. These scenarios are to be taken as signposts, pathways or stages, like the points of a compass. They are archetypes for the future, to help illustrate trends and provide insight into what might lie ahead. The division into four scenarios arises from two forward-looking works: Future Scenarios by David Holmgren,  and Resilient Cities, by architects and planners Newman, Beatley and Boyer. The first work describes the possible trajectories in relation to peak oil and climate change. If climate change has a gradual effect (providing enough room for manoeuvre to transform society), there are two possible scenarios: a ‘green tech’ transition, which, if resources decline slowly, could be relatively comfortable, or a radical and rapid change, known as ‘earth stewardship’, in the case of a brutally rapid decline in energy resources. By contrast, if climate change has rapid and violent effects, society will tip into a ‘brown tech’ future, where the powers that be would muster all their force to maintain ‘business as usual’. Or, even worse, society could completely collapse – the ‘lifeboat’ scenario – if these catastrophes coincided with a rapid loss of resources. The second publication focuses exclusively on the end of oil, and analysing its effects on cities. It explores the following question: knowing that cities are completely dependent on oil, and have a massive carbon footprint, what would be the consequences for modern industrial cities of the end of the oil age? Two areas in particular are explored: transport and food security. 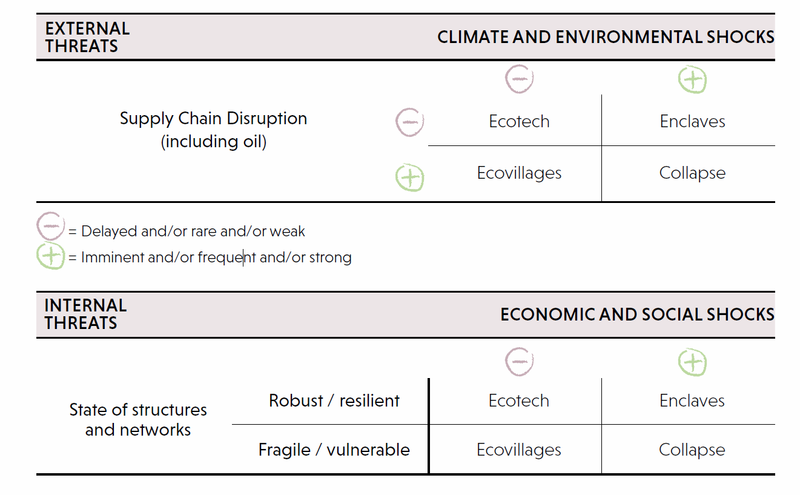 The authors describe four scenarios, similar to those of Holmgren: the resilient city (corresponding to the ‘green tech’ scenario), the divided city (‘brown tech’ scenario), the ruralised city (‘earth stewardship’ scenario), and the collapsed city (‘lifeboat’ scenario). If the impact of global warming turns out to be gradual, and an ‘energy descent’  can be managed, society can adopt ‘green’ technologies, ensure a successful transition, and work towards distributed renewable energy systems, without conflict or disasters. This would lead to a resurgence in regional, rural economies, more sustainable agriculture, more horizontal political systems, and more compact cities that prioritise public transport and the local economy. A balance would be found between reducing consumption and slowing economic growth, thanks to energy efficiency technology and a relocalisation of the economy. However, it is only possible for a city to take this route if it already has a resilient, well-maintained infrastructure, and if it avoids major political, economic and social upheavals. This is clearly the most desirable scenario in terms of maintaining the living standards and security that our democratic societies rely on. To sum up, in the absence of significant obstacles, even in the context of an energy descent, an efficient transition is still possible. The city can prepare, slowly but surely, for the ‘storms’ ahead. A rapid decline in resources, including oil and natural gas, could trigger a crisis that would bring the world economy to its knees. This global collapse could create political instability, which would in turn lead to serious social problems, but also, paradoxically, to an end of greenhouse gas emissions. Local resilient communities would then emerge in some rural areas (following a massive rural exodus). This would be achieved through agro-ecology and permaculture techniques, and above all by sustaining their capacity for local democracy. It is possible that the major megalopolises would still contain rich, private, gated neighbourhoods, by developing urban agriculture within suburban gardens. In this scenario, no-one believes civilisation can be preserved as it stands; people will have moved on, to work for something radically different. Cities would return to being semi-rural, meeting many of their food and energy needs very locally, along the lines of self-sufficient medieval towns. Peri-urban belts would be made up of ecovillages, supplying the town and recycling waste, much like the Parisian market gardeners of the 19th century. However, this ‘radical resilience’ policy will only be practicable if massive disasters (hurricanes, uprisings, revolutions, etc. ), that could destabilise the political and social order are neither too intense nor too frequent. If they do occur, the organisation of the city could change radically, whilst retaining a chance of avoiding breakdown and chaos, and maintaining a semblance of democracy, albeit at increasingly local levels. In this scenario, the city is instantly transformed, yet without being wiped out by the ‘storms’. A slow decline in energy supply could leave influential power structures in place, thus thwarting any chance of real transformation. The combination of an authoritarian state and greedy private business would foster an extraction industry rush for non-renewable resources, with predictably catastrophic consequences. But then the climate and environmental crises would be so overwhelming that all of society’s energy and resources would be needed to keep the ship afloat, due to policies that are centralised, securitised, militarised, and inegalitarian. The city would splinter; the rich, cocooned in their safe neighbourhoods, would maintain access to increasingly expensive supplies, protecting themselves from climatic variations with new technology. The poorest in society would be left to their own devices in semi-rural areas (with survival vegetable plots providing resilience), or even shanty towns, with less and less reliable access to resources. In this scenario, the economic elite (the rich) and political elite (the government), in their opulent enclaves, would use violence and fear to maintain their privilege. These elites would have no choice than to bring in ever more oppressive laws. Those in the most precarious situations would gradually lose the means to protect themselves from environmental and social disasters, and certain districts (crowded with arriving migrants) would become shanty towns, and police no-go areas. Political cohesion, and thus democracy, would be the first victims, leaving the field open for the expansion of the private sector and its irresistible machine for generating ever more privilege and social division – in other words, social chaos. The city crumbles, the rich ‘manage’ the crisis, everyone else endures it, and the former control the latter by increasingly undemocratic means. If rapid economic and political collapse (the Ecovillage scenario) is compounded by severe environmental and climate crises, it is too late to take the resilience route; collapse is inevitable. History shows that a lack of preparation combined with a succession of various disasters will end up getting the better of any city. There is no lack of examples of dead cities, such as Ephesus, the port and second largest town in the Roman Empire, abandoned in around the year 1,000 when the river dried up after all the trees on the surrounding hills had been felled. War, illness, and famine have always cleared cities of their inhabitants, and this can still happen. In Syria and Libya, armed conflict has devastated entire towns, which have still not recovered. When the shock is too brutal, some of the urban population flee, and those who cannot, stay, prey to shortages and chaos. Epidemics and/or conflict can reduce social life to clans controlled by local warlords. Some small population clusters would survive in exceptionally favourable conditions (such as a healthy river, stable damn, fertile fields, or an isolated monastery). These small islands (Holmgren’s ‘lifeboats’) would be humanity’s only chance to find a way through a dark period and retain the hope of renaissance in a few decades, or centuries. In this scenario, unpredictable and irreversible domino effects lead to the rapid breakdown of the city. 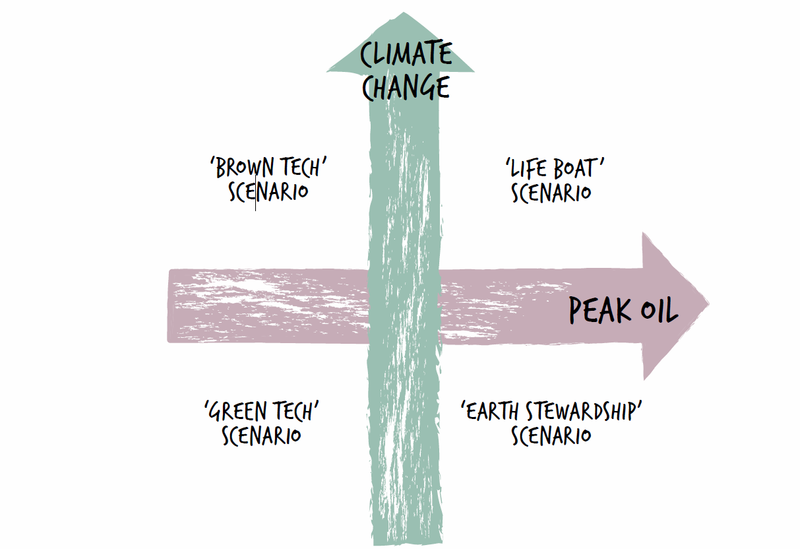 This four-scenario compass provides us with a new way of looking at the future. It enables us to see more clearly what is at stake: from a hardening of class relations, de-industrialisation of towns, urban exodus, and infrastructure collapse to the development of green technologies. Even if the details of these trajectories are not specified, global trends are clear: towards catastrophes, or what some might term collapse. These narratives differ from the more common forecasts, based on myths around technological progress, and luring us with a future ever more connected to the virtual, and thus in the end disconnected from the natural. But we have clearly run up against the limits of this approach (and of earth-system science), and now we must prepare for a future of rupture and interruption. In the cities of industrialised countries – including, need we add, Europe – it is highly likely that we will reach ‘peak urbanisation’ over the next decade. In other words, we cannot carry on in this ultra-urban direction. The future of industrial towns will more likely be one of depopulation, reconnection with green belts and the countryside, an overdue reduction in social inequality, and the re-localisation of the economy. It is up to us to tip the balance in favour of a particular scenario. Even if the precise nature of these scenarios is not clear, we can be sure that the urban future has to be resilient. Cities will have to weather various kinds of ‘storms’, some with more ease than others, and this will radically transform how Europeans design and inhabit their cities. Anticipating these ‘storms’ today, feeling and imagining them, equips us to be prepared, and thus avert disaster. This is a revised version of an article that was first published on barricade.be. 1. P. Servigne (2017). Nourrir l’Europe en temps de crise. Vers de systèmes alimentaires résilients, Babel. 2. I. Goldin & M. Mariathasan, (2014). The butterfly defect: How globalization creates systemic risks, and what to do about it. Princeton University Press, p.101. 3. P. Servigne & R. Stevens (2015), Comment tout peut s’effondrer. Petit manuel de collapsologie à l’usage des générations présentes, Seuil, p. 116. 4. R. Wilkinson, & K. Pickett (2009). The Spirit Level: Why Equality is Better for Everyone, Allen Lane. 5. O. Razemon (2016) Comment la France a tué ses villes, Rue de l’échiquier. tropical forests. See N. B. Grimm, et al. (2008). Global change and the ecology of cities, Science, n°319, pp. 756-760. 7. P. Servigne & R. Stevens (2015), op. cit. 9. P. Newman et al. (2009) Resilient cities. Responding to peak oil and climate change, Island Press. 10. Here, armed conflict is not included in external threats, and civil war not included in internal threats. 11. In the context of a post-peak oil transition, this refers to the shift away from an increasing use of energy to a reduction. 12. A. Sinaï et al. 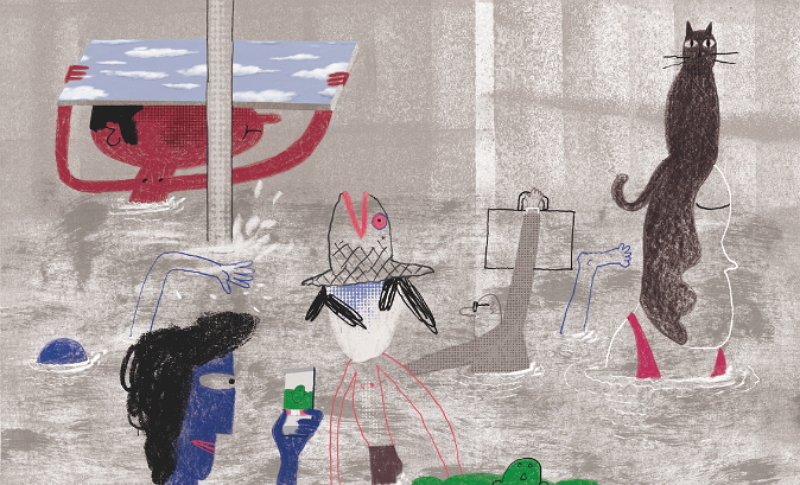 Petit traité de résilience locale, 2015, Éditions Charles Léopold Mayer. The Green European Journal, published by the European Green Foundation, has published a very interesting special issue focusing on the urban commons, which we want to specially honour and support by bringing individual attention to several of its contributions. This is our 2nd article in the series. It’s a landmark special issue that warrants reading it in full.